An international research group under the leadership of Kiel physicist, Richard Berndt, has answered two of the key issues in molecular electronics, namely, how contact to an individual molecule can be created in a controlled manner, and how the type of contact can affect the electronic characteristics. The researchers from Germany, France and Spain published their findings 14 November 2010, in the online advance edition of Nature Nanotechnology. The physicists constructed a row of contact areas, each consisting of only a few atoms, on a copper surface. They used a pointed copper tip to introduce a single carbon molecule (C60) to every one of these ultra small contacts and determined the electrical resistance of each. "Initially, the connection between the molecule and the surface consisted of just one single atom", explained Dr. Guillaume Schull, who until recently used to carry out research at Kiel University (Christian-Albrechts-Universität zu Kiel (CAU)). "By gradually increasing the number of contact atoms, the electricity conducted through the molecule could be multiplied more than tenfold for the time being." In the case of the C60-molecules, however, this positive trend reached a limit: "As from five contact atoms, the molecule itself starts to act as a bottleneck for the electricity flow", according to Professor Berndt. While molecular machines exist for almost every technical function imaginable in living nature, the corresponding technology is still in its infancy. Methods have been sought for many years on how to build electrical switches from individual molecules, which could enable electronic components to become even smaller in the future. 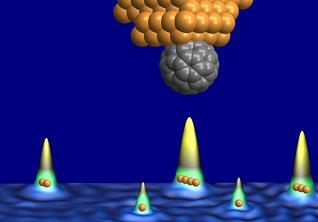 The research findings should help to better understand the characteristics and processes on the single molecule scale. The knowledge of conductible molecules will be incorporated in the development of electronic components based on organic materials. Kiel University (CAU) has proven international expertise as a North German research university in the field of Nanoscience. The members of the Collaborative Research Centre 677 "Function by Switching", of which Professor Berndt is also a member, study the field of molecular nanoscience. Furthermore, the CAU is applying for the current round of the Excellence Initiative with the nanoscience cluster of "Materials for Life". Within the framework of the cluster, Kiel scientists wish to research new, intelligent materials for medical therapy. G. Schull, Th. Frederiksen, A. Arnau, D. Sanchez, R. Berndt: Atomic-scale engineering of electrodes for single-molecule contacts.